Jetset through Vietnam visiting the must-see attractions of Hanoi and Saigon, followed by the temples of Angkor in Cambodia! If you’ve only got 9 days and want to be whisked around without any fuss, then this is the Vietnam and Cambodia itinerary for you. Our guides and support staff will do all the hard work to ensure that you get the most out of this fast paced trip. Start in the capital of Vietnam, Hanoi, with its French colonial architecture, bustling old quarter. 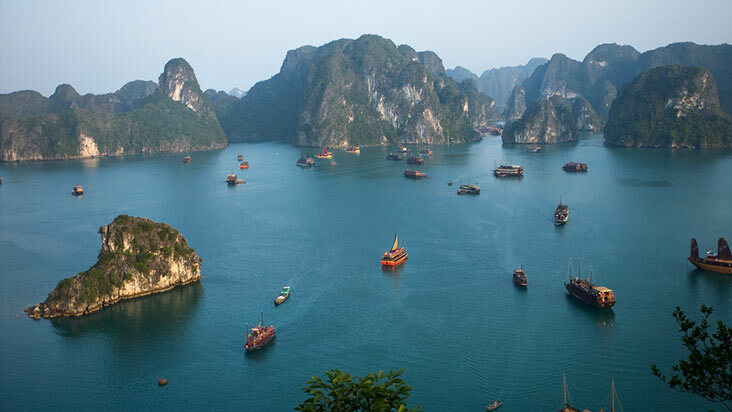 Spend two days on breathtaking Halong Bay where thousands of limestone rock sculptures jut dramatically from the sea. 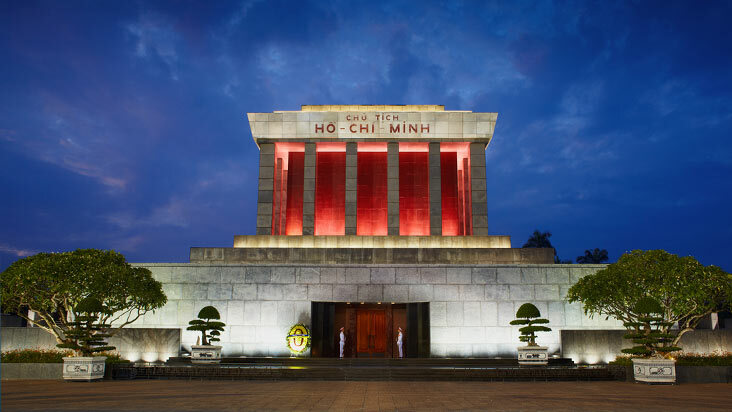 Fly to Ho Chi Minh City (Saigon) in southern Vietnam, a sprawling metropolis with its Vietnam-American war history including the Cu Chi tunnels, and a day trip to the bustling Mekong Delta. 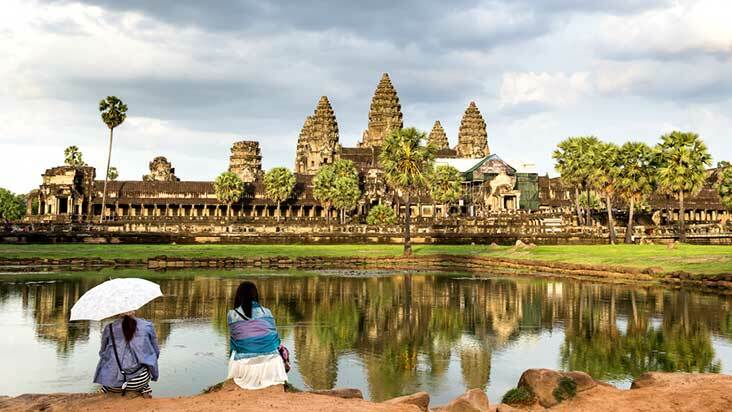 Fly from Saigon to Siem Reap in Cambodia, home to the fabled city of Angkor. Discover temples including Angkor Thom the ancient royal city of the Khmer Empire and Ta Prohm, buried in the jungle. Marvel at the morphing scene of Angkor Wat as the setting sun washes this mysterious monument in haunting red hues, and finally explore Banteay Srei, the jewel of Khmer art, with its red sandstone walls decorated with elaborate carvings. You will meet your guide on arrival, transfer and check-in to your hotel. During the drive your guide will provide an introduction to Hanoi, answer any questions you have, and make arrangements for the following day. Enjoy free time for the remainder of the first day. Itinerary Option: If you’re arriving to Hanoi in the morning, discuss additional day 1 activities with our staff. Itinerary Option: Your Guided tour can include alternate attractions like the Hoa Lo Prison (Hanoi Hilton) and/or the Fine Arts Museum. Our staff can provide advice based upon your interests. 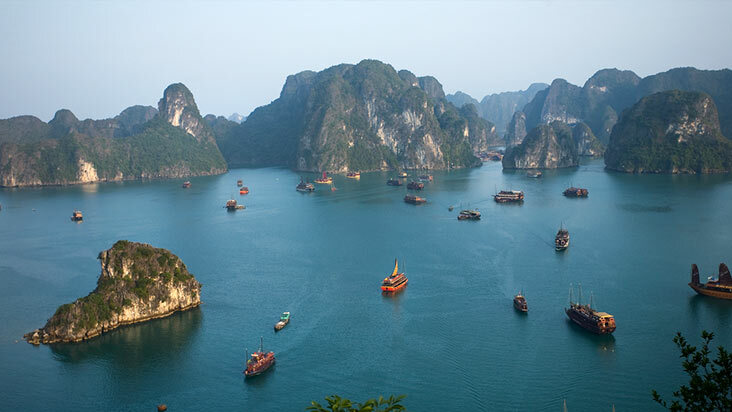 Travel to the UNESCO World Heritage Site of Halong Bay and board your deluxe junk for your overnight cruise. Marvel at the dramatic vista and relax onboard, as you sail amongst the thousands of limestone islands that rise from the turquoise waters of the Gulf of Tonkin. Rock sculptures jut dramatically from the sea and the numerous caves and grottoes have created an enchanting, timeless world. Set sail through Bai Tu Long Bay whilst a seafood lunch is served, then sit back, relax and enjoy the scenery as you cruise past various islands en route to Cua Van fishing village. Explore the floating village by bamboo rowing boat. Visit Tien Ong Cave before returning to the junk for sunset cocktails and canapés, followed by dinner served on the deck or in the restaurant. Why not begin the day with a Tai Chi class on the top deck? Or just admire the beautiful scenery as the sun rises over the azure waters. Choose between an excursion to a secluded island with a sandy beach for a morning swim, or join the chef for a cooking demonstration to learn more about Vietnamese cuisine. Enjoy a buffet brunch as your junk cruises Halong Bay, passing islets and caves as you make your way back to the dock. You have the option to visit a pottery workshop on the trip back to Hanoi before flying to Saigon in the afternoon. Meet your guide on arrival in Saigon and transfer to your hotel. During the drive your guide will provide an introduction to Saigon, answer any questions you have, and make arrangements for the following day. Enjoy free time for the remainder of the day. After returning to Saigon, learn about the city’s historic landmarks as you tour the city with your guide. Visit the Notre Dame Cathedral, a red brick building with twin spires based on the original construction from Paris, then head across the square to the Central Post Office designed by the French architect Gustav Eiffel. Next stop is the former Presidential Palace, headquarters to the Saigon Government during the Vietnam-American war. You may also like to visit the War Remnants Museum for a vivid insight into the Vietnam-American war from a Vietnamese perspective. Get a late flight from Saigon to Siem Reap and meet your guide on arrival, transfer and check-in to your hotel. Your guide will make arrangements for the following day. Wake up to Siem Reap. Situated in the north west of the country, Siem Reap is an enchanting town with Chinese-style shop houses, French colonial architecture and tree lined boulevards. It is the gateway to the World Heritage ancient temple ruins of Angkor, eighth wonder of the world and spectacular ancient capital of the powerful Khmer Dynasty. As well as the myriad of awe-inspiring temples and Khmer relics to explore, Siem Reap and its rural outskirts offers craft villages, silk farms, Khmer cuisine cooking classes, traditional Cambodian “apsara” dance performances and the floating villages on the tranquil waters of Tonle Sap Lake. Depart this morning with your guide to visit temples of the World Heritage Angkor complex. Visit Angkor Thom, the ancient royal city and former capital of the Khmer Empire. The fortified city of Angkor Thom consists of several temples including the Bayon, Baphuon, Terrace of the Elephants and Terrace of the Leper King. Enter the city through the impressive South Gate and drive towards the centre piece, the Bayon Temple. At first glance the temple appears as a shapeless mass of stone, but further scrutiny reveals the enigmatic faces of former King Jayavarman VII looking in every direction. There are over 200 huge carved faces that stare down from fifty four towers. Continue your exploration with a visit to the Terrace of the Elephants, which served as a platform from where the King viewed the victorious return of his army. Then visit the Terrace of the Leper King with detailed carvings winding along a narrow passage that leads to the Baphuon. After time for lunch in Siem Reap, set off again to explore Banteay Srei temple, the jewel of Khmer art, built in the 10th century and dedicated to the Hindu god Shiva. This red sandstone temple is one of Angkor’s most significant structures. The temple walls are covered in elaborate and well preserved carvings that provide an insight into the Angkor people and their beliefs. In the late afternoon, return to your hotel in Siem Reap. Halong Bay: Why not spend two nights on your traditional junk boat? Refer below for details on the different boats. 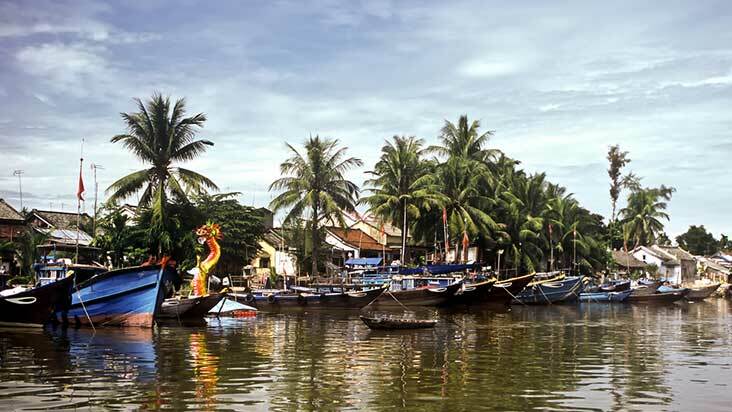 Mekong Delta: Add a full day cycling tour through the Mekong Delta passing local houses and family farms, crossing single lane bridges, and exchanging “xin chao” with waving locals. Note that the schedule above refers to the Jasmine and Ginger luxury sailing Junks. The schedule on the Halong Bay Sails junk used on the budget price standard differs, although it is similar. The Jasmine and Ginger are luxury sailing junks with polished woodwork, French Indochina design, refined Asian decor and golden sails. The sundecks are complete with lounge chairs giving you the opportunity to sit back, relax and enjoy the spectacular scenery of Halong Bay. Relax at the bar and enjoy meals in the restaurant where lavish international brunches, casual Vietnamese lunches and formal dinners are served. The cabins offer panoramic windows or private balconies, with individually controlled air conditioning and glass standing showers. Various optional activities are offered including kayaking to explore the bay’s uninhabited islands and caverns, tai chi, cooking classes and wine tasting. GetAboutAsia recommend these Heritage Line junks for our Halong Bay one and two night stays due to the fantastic feedback received from our customers and from our own experience on these amazing boats. With our good relationship with Heritage Lines, we also believe these boats represent good value for this once in a lifetime experience. The Halong Bay Sails is a traditional wooden junk with modern facilities and amenities. Cabins are decorated simply but comfortably, with large windows, en-suite showers and air conditioning. The restaurant serves fresh seafood caught locally, and the bar serves coffee and cocktails. There is a large sundeck complete with sun lounges enabling you to relax and enjoy the beauty of Halong Bay. Excursions are similar to those on the Jasmine / Ginger junks, and include trips to floating villages or exploring rock formations by boat or kayak. The Halong Bay Sails is used on the budget itinerary option. Hotels or Halong Bay Junk each night of the itinerary (excluding your departure day). All GetAboutAsia accommodation is handpicked by us. Upgrades are available for this itinerary. All breakfasts at your hotel or aboard your junk each morning. This trip package includes 2 internal flights (Hanoi - Saigon and Saigon - Siem Reap) which retail at about 200AUD per flight.